In short: A high-revving, quick-shifting roadster. Picture one of those old-time motoring enthusiasts. Some middle aged English chap with a tweed cap perched atop his graying hair; a tartan scarf wrapped around his neck flapping in the wind. He sits inside the narrow confines of an Austin Healey or perhaps an MG A, grasping its wood steering wheel while zipping around corners feeling just about every nuance of asphalt. This is where the concept of the roadster came from: a small, two-seater with impeccable handling and adequate power. Forget that three-day trek to Yosemite or commuting to work, roadsters are meant to be weekend playthings. 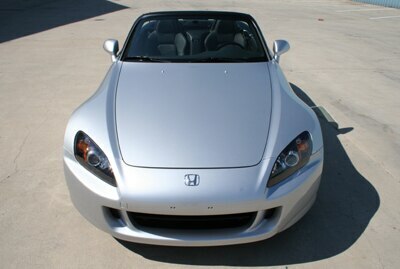 Although it comes from the Land of the Rising Sun rather than jolly old England, the Honda S2000 embodies the spirit of the classic roadster brilliantly. It charges through twisty roads, gripping the pavement with tenacity while providing excellent amounts of feedback. This is a driver’s car through and through. A step up from the Mazda MX-5 Miata, but below the Porsche Boxster, the S2000 sits in its own little niche offering a raucous firecracker of an engine that gets an incredible 237 horsepower out of four naturally aspirated cylinders. To get all this power, you’ve got to drive it like you’ve stolen it, revving it up toward its digital redline of nearly 8000 rpm. However, if you shift like a normal person around three to four grand, the S2000 provides acceleration that’s very average. This doesn’t dissuade from the handling, but if you’re looking for a torquey little rocket, search elsewhere. Also, at about 65 mph and in sixth gear, the 2.2-liter is already churning above 3500 buzzy rpms. It might seem ridiculous, but is a 7-speed manual possible? If it were, hopefully it would be as wonderful as the car’s actual 6-speed. 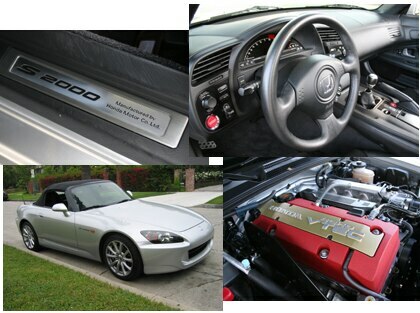 Honda is known for making some of the best and easiest to use manual transmissions in the world, and the S2000’s is perhaps their best offering. The shifter action is buttery smooth with razor-thin throws tied to a short-travel clutch that even a jittery drivers ed kid could use. The whole set-up makes you want to perpetually accelerate, shifting through gears and perfecting a brilliant balance between heal, toe and right arm. And you’ll get plenty of practice, as the VTEC engine’s revvy nature requires a lot of gear rowing to get the most out of its peaky power band. The cockpit is snug, but offers enough room for taller folks. The chunky, small-diameter wheel sits perfectly in place, providing a flawless extension to the excellent, well-weighted steering. Controls sit inches away from the driver’s hands on a pair of high-up wings that extend with the A/C vents from the well-executed digital instrument cluster. Although wheel-mounted buttons would be handier, the set-up is easy to acclimate to. But there are some significant ergonomic foibles. The full radio unit sits low on the dash behind a nice-looking metal cover that drops down onto the console. This cover is too wide, though, and its corner falls right where a taller driver would place his or her right leg. Closing it is an option, but while there are redundant radio controls adjacent to the steering wheel, there is no redundant read-out to remind you what channel or CD track you’ve selected. That complaint would probably fall into the realm of every-day drivability, as would the engine’s peaky, high-revving nature. If you’re looking for a two-seater convertible in this price range that you could live with every day, the BMW Z4 is perhaps a better choice. But then again, all those classic roadsters that came before the S2000 (Miata included) were intended to be driven on a limited basis, as a second car providing all the fun that its owner’s staid family sedan or luxury car couldn’t muster. 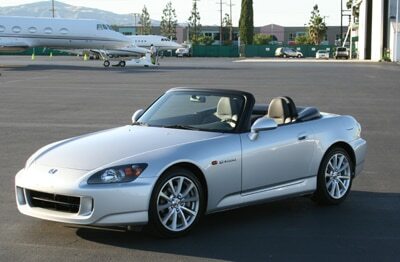 If that sounds like your cup of tea, the S2000 might be the perfect accessory for that plaid scarf and tweed cap. Warranty/Service: 3-year/36,000-mile basic warranty; 5-year/60,000 powertrain warranty.